On October 10th, Lacoste filed a complaint in the U.S. District Court for the Southern District of Florida against dozens of online merchants accusing them of violating Federal trademark laws. The company alleges the defendants are causing irreparable harm. 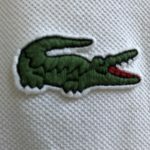 In addition, Lacoste claims the defendants are making substantial profits and are “likely to transfer or secret their assets to avoid payment of any monetary judgment awarded to plaintiffs.” Lacoste is seeking an injunction to stop the defendants from selling the counterfeit items and disable the seller IDs. This entry was posted in Real or Fake Lacoste by JFP. Bookmark the permalink.